Last weekend the plan was to spend a few days with a friend at Parker Canyon Lake south of Tucson. Didn't quite happen according to plan. The friend had to cancel because of a family crisis. I went down solo, and the place was full. Packed. Lots and lots of children ... little girls on pink bicycles seemed to prevail. The campground host site was empty... I could have stayed there and hoped that the host wouldn't show. But the idea of getting rousted out in the evening when he/she appeared wasn't appealing. So I flipped a coin. Tails. I turned around and went home. It turned out that the reason for the crowd was Spring Break. We take Spring Break seriously in these parts. Stayed home for a day and decided that the rig was all packed, so it was time for another visit to the New Mexico park system. There was a vacancy for Monday (that's today) in their on line system, so I jumped on it. And here I am. Exactly where I'll be tomorrow remains to be seen. But for the moment I have a great spot with electric and water and good views. Stay tuned! One is a shopping list of "ingredients" for mobile meals. I can take this list to the store and buy as much as I think I'll need for the time I'll be out. It's divided in two parts: one is stuff that needs to be refrigerated, the other is stuff that is OK at room temperature. The cold stuff has to be loaded a day or so after the refrigerator is turned on. The other stuff (cereal, for example, or canned tuna) can be put in the rig at almost any point. 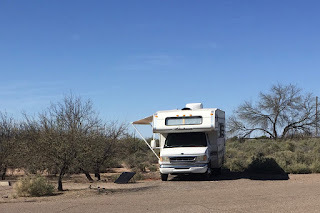 I've thought about clothing, and poked around in my closet and found stuff which fine for RV travel and can simply live there; when it gets laundered after a trip it can go right back in the rig whenever I'm headed that way (it's stored 10 minutes away from my house.) So I shouldn't have to sort and pack clothes much. The final piece is to empty holding tanks before I leave my last campsite, and to refill gas and propane tanks on my way into town. That way the rig is ready to roll at almost any point; the gas station is on the road home just before I get there, and the propane place is between home and the storage lot. Done deal. This doesn't mean I could just jump in the rig and go. But it's closer, and as the weather here gets hot, the less running around and packing I have to do, the better. Now to think about the latest repair job: the strings on one of the pleated blinds broke last trip, so I have to get on YouTube and watch how it goes to repair one of those. It's cool and cloudy here, so this is a good time to work on things like this. I'm back from a weekend at Roper Lake, just south of Safford, AZ. This was an impromptu weekend away, organized by friends here in Tucson ... it's about a 2-hour drive from home. The GPS coordinates for the park are 32°45'21"N, 109°42'17"W Elevation 3130 ft. The park is a pleasant place ... Roper Lake was constructed as a reservoir, and there's a swimming beach, fishing, lots of ducks, rental cabins, and even a hot (warm-ish) spring for bathing. The park was booked full for the weekend ... for a while I was worried about loud music and happy (read:screaming) kids nearby, but everyone quieted down and there was no problem sleeping. This was my first experience with what the RV world seems to call a "meetup." 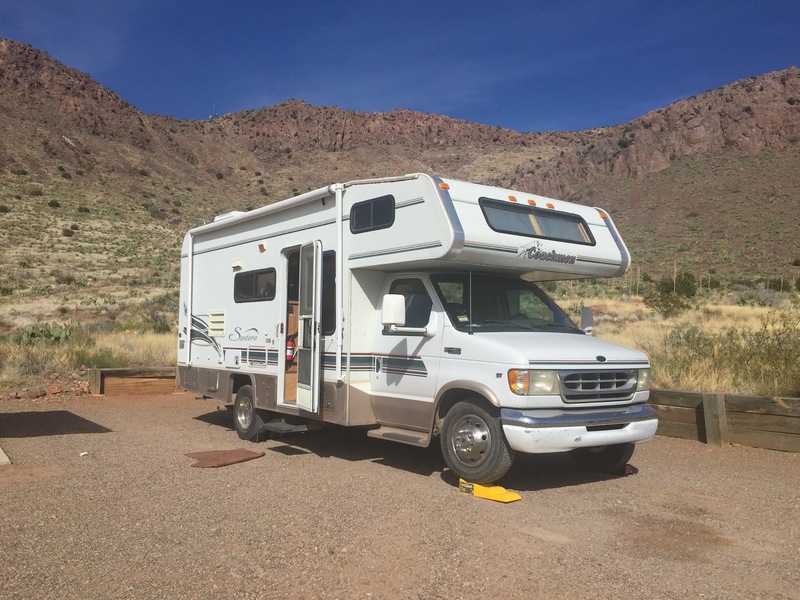 A group of friends in Tucson proposed this trip, and I was happy to join. What I hadn't expected was a trip into town for brunch on Saturday, another trip into town for dinner, and a nightcap at the bar where some local friends-of-friends. A good time was had by all. I woke up really early in the morning on Sunday, and left after breakfast; was back in Tucson about 10:30. The rig was unpacked and parked in the storage lot by mid-afternoon. As I noted after my short trip to Buenos Aires sanctuary earlier this spring, there's a lot of logistics overhead in a weekend trip. But the change of scenery, and time with some friends, made it well worthwhile.